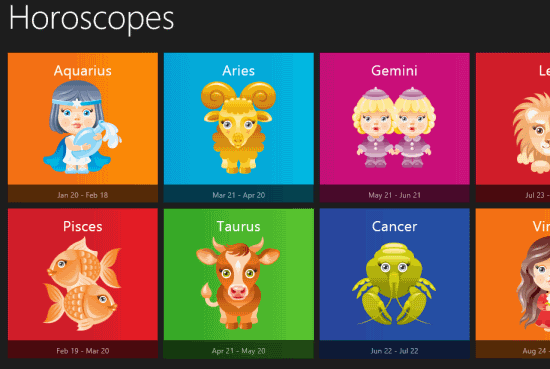 Horoscope & Astrology is a free Windows 8 horoscope app in which you can check your astrological predictions. The Astrological predictions are shown on the basis of your Zodiac sign. It provides horoscope for all the 12 Zodiac signs: Aquarius, Pisces, Aries, Taurus, Gemini, Cancer, Leo, Virgo, Libra, Scorpio, Sagittarius, and Capricorn. The astrological predictions are shown for different categories: Wellness, Intellect, Love, Emotions, Intuitions, Creativity, Work, and Money. The app provides horoscopes for 3 days. It also shows power numbers and famous international personalities born on same day. With this app you can check your daily horoscopes in a single click. You can refresh your app anytime to update horoscopes. While the app automatically updates horoscope regularly. Simple interface and hence easy to use. No ads to disturb you still completely free. Shows horoscope for all 12 Zodiac signs. Predictions are shown for different categories: Wellness, Intellect, Love, Emotions, Intuitions, Creativity, Work, and Money. Provides horoscope for three days. Shows power numbers and famous personalities born on same day. Similar apps: Your Horoscope, Celtic Cross Tarot. You can get free Horoscope & Astrology app from Windows store by using the link given at the end of this review. 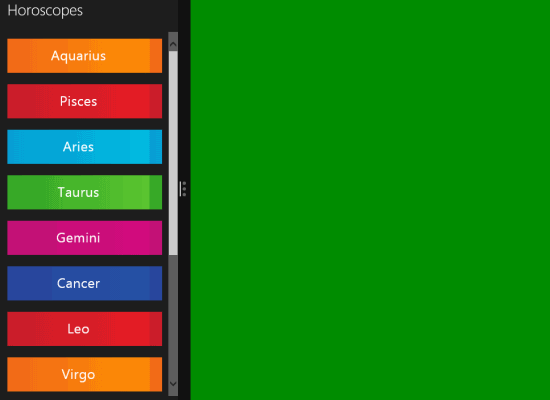 After launching the app, you will find all 12 Zodiac signs on colorful tiles. Scroll right to see more. Each tile contains the name of zodiac sign with date and month. Choose your zodiac sign as per your date of birth. Click on the specific zodiac sign to read predictions. 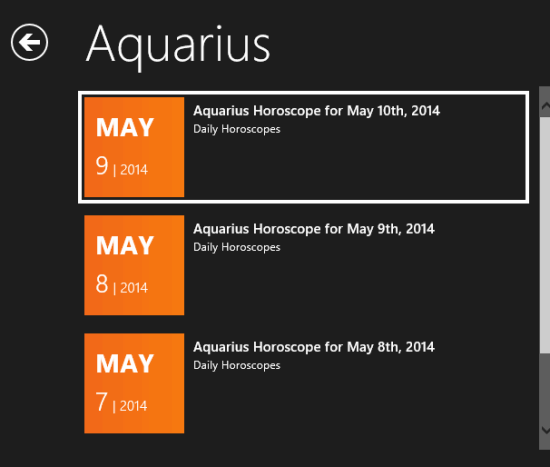 After clicking on the Zodiac Sign you will get 3 different dates on the left side of the screen. The app lets you check your horoscope for 3 different days: today, tomorrow, and the day after tomorrow. Click on the particular date for which you want to read your astrological predictions. 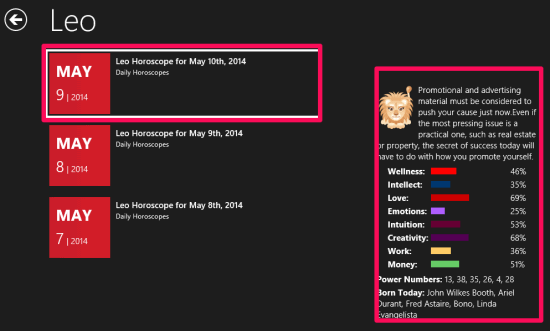 For every day you will find a summary of your astrological prediction like how will be your day? It also shows percentage of different parameters : Wellness, Intellect, Love, Emotions, Intuitions, Creativity, Work, and Money. At the end you can also check the power numbers and the person born on that particular day. One more feature of this app is that it works well in snapped view mode. So that you can check your horoscope while doing other stuffs as well. Horoscope & Astrology is an average horoscope app for astrology predictions. The best thing I like about this app is that it lets you check horoscope for three days that is for today, tomorrow, and the day after tomorrow. The different parameters of predictions makes the app more interesting. So if you are looking for an app which can update you with your daily horoscope, then you should try it out. Get Horoscope & Astrology app here.